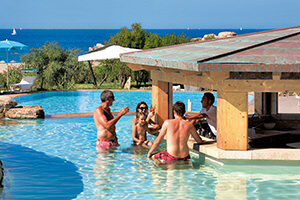 Give more flavour to your holiday in Sardinia and enjoy a genuine taste experience with Delphina hotels & resorts. The restaurants, gourmet pizzerias and beach bars at the Delphina hotels and resorts are the ideal place for satisfying your taste buds and savouring the island’s excellent products. Sardinia is well-known for the excellent quality of its agricultural products, tasty meat and the freshness of its fish and seafood. This is why all our restaurants respect and honour Sardinian gastronomic tradition and offer menus with typical dishes that go well side by side with the sophisticated Mediterranean and international cuisine created by our chefs. 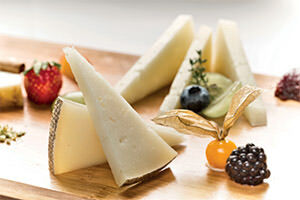 The result is a culinary experience to be enjoyed in the elegant restaurants of the Delphina hotels and re-sorts: surrounded by breathtaking landscapes you will be able to discover the true flavours of Sardinian traditions and experiment with a range of delicate and refined combinations. Each course will be an exhilarating experience for your senses! Get ready to enjoy an irresistible gourmet experience, a halfway point between sophisticated Mediterra-nean cuisine and Sardinian regional traditions. In the spectacular setting that is home to the Santa Teresa Gallura Resort, the gastronomic experience is easily up to the standards of the most demanding gourmets. 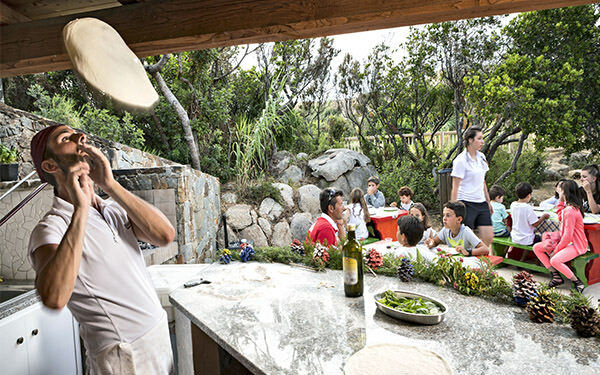 The Gallura restaurant is a must, as is Li Zini for barefoot dinners on the sand while children have their own pizzeria because when you are on holiday, everyone can be greedy! An intense experience full of different flavours is waiting for you at this hotel in Isola Rossa, the result of a perfect mix of typical Sardinian cuisine and creative culinary interpretations. Let yourself be amazed by show cooking, sophisticated menus and gourmet pizzas! Savouring each course is like watching a once-only spectacle. 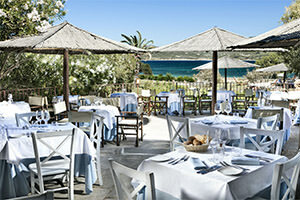 An unforgettable gastronomic experience in Sardinia starts with the pleasure of sitting down to eat. 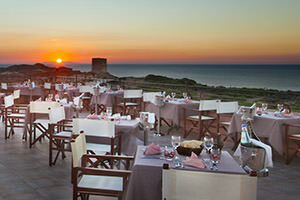 Every evening a breathtaking sunset over the Aragonese tower accompanies delicious and sophisticated dishes, all to be enjoyed in the two restaurants facing the sea. Small masterpieces of taste enhanced with impeccable service. 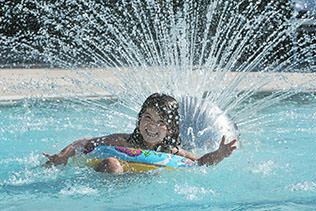 10 unique ways to enjoy your holiday at the resort in Badesi. 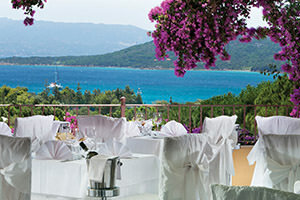 Quality and variety are to be enjoyed in a wide range of different interpretations of taste from traditional Sardinian, Mediterranean and ethnic cuisine to seafood specialities and from delicious grilled meat and fish to the classic pizzeria and a special gastronomic offer designed just for children! 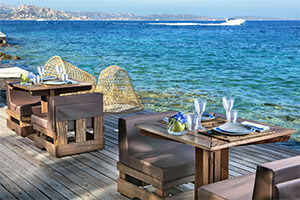 The restaurants at this hotel in Palau will be able to satisfy even the most demanding palates. A varied and sophisticated cuisine available for the whole family without forgetting a little restaurant for the youngest guests and romantic candlelit dinners overlooking the crystalline sea of the North of Sardin-ia. 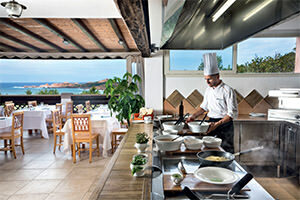 At the resort in Cannigione, the gastronomic delights on offer represent a culinary journey between the typical tastes and flavours of Sardinia and international cuisine prepared by award-winning chefs. 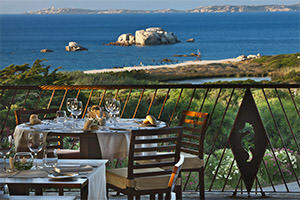 Guests at the residence in Palau can take advantage of the cuisine on offer at the nearby Hotel Capo d’Orso. 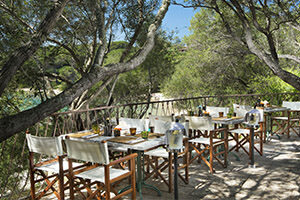 The Approdo Pizzeria and snack bar and the excellent Il Paguro Restaurant are immersed in the luxuriant greenery of Cala Capra park, perfect for an authentic taste experience. When eating and drinking, quality is the most important element. With the Genuine Local Food Oriented brand, Delphina supports healthy, correct and fair cuisine, comprising genuine ingredients and local prod-ucts. Spoil your taste buds with the Brunch Mediterraneo® formula and enjoy a really tasty experience. Children, it’s time to eat! After endless days of playing together with new friends and friendly entertain-ment staff, coming back to eat with Mum and Dad is just one option when you are on holiday. 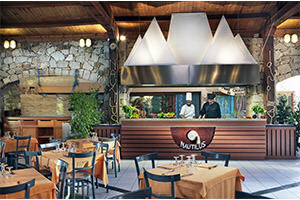 The restaurant and pizzeria with wood-burning oven at the Resort Valle dell’Erica offers a delicious menu every day, prepared by the chef with genuine 0 km products. At Park Hotel Cala di Lepre, after lots of fun and games you can stay together with your new friends and continue to have fun during lunch or dinner in the special restaurant dedicated just to you. Under the spacious veranda of the Peter Pan restaurant at the Resort Le Dune, you can taste the most delicious and imaginative dishes you have ever eaten. If you are good at collecting the fruit and vegetables from the resort's organic vegetable garden and the eggs laid by our free-range hens, our chefs will cook them for you!